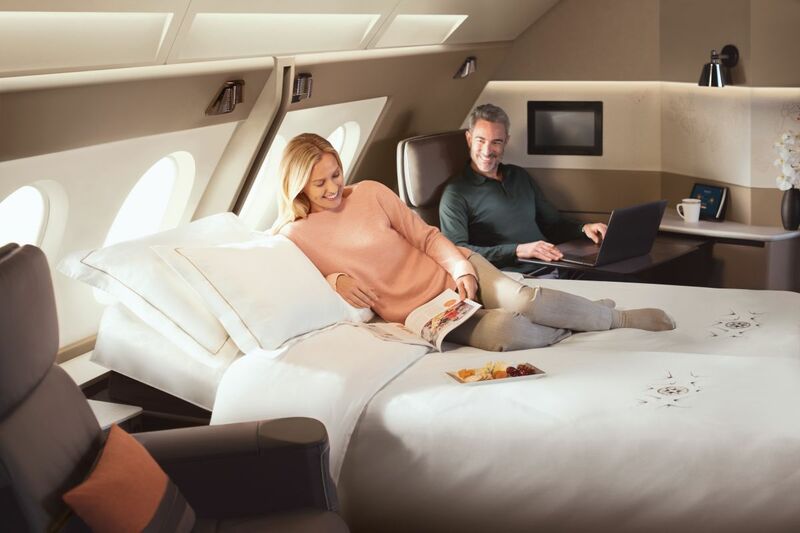 Singapore Airlines (SIA) just launched a series of new cabins for its revamped Airbus A380 aircraft, including new seats in first, business, premium economy and economy classes. The US$850 million overhaul marks a decade since SIA welcomed the superjumbo four-engine jet airliners to its fleet. First class suites, which now boast more space, have shifted to the lower deck. Each suite is designed to offer an actual bedroom experience, so passengers can cruise through the skies as if in the comfort of home. The number of suites have also been reduced by half, with only six suites per airline in the update, while added privacy comes in the form of electronically adjustable roller-blinds and sliding doors. A Poltrona Frau leather chair adorns the make of each stunning suite, which includes a standalone full-flat bed dressed with luxurious duvets and bedding by Lalique. The business class cabin has also been refreshed, with 78 business class seats on the upper deck instead of 60 or 86. The seats are now supported by a carbon fibre composite shell structure instead of metal, which previously made the primary support structure (a typical feature on traditional aircraft seats). The thinner base structure, reportedly a world premiere, can now accommodate a standard-size trolley bag under the seat. The seats can also recline directly into a 78-inch full-flat bed for added comfort, with the option to lower the divider to form double beds. In-flight entertainment have also welcomed some industry firsts, such as content recommendations specifically tailored to content recommendations and a viewing history. Passengers can also use myKrisWorld to save preferences for future flights. The A380 cabin updates have taken extensive customer feedback into consideration, and have culminated since upgrades began in 2013. The superjumbos first made its debut with SIA in October 2007, flying to major cities including Beijing, New York, Paris, Frankfurt, London, Melbourne and Hong Kong. Flight SQ221 will be the first in the series of revamped A380s to fly, with more destinations to be announced in the following months. SQ221 will depart Singapore for Sydney on December 18 at 8.40pm.